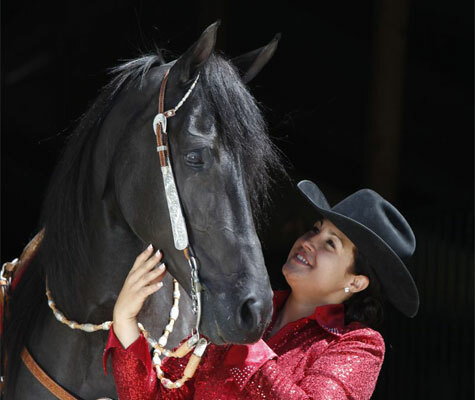 Denise Bader is a professional Tennessee Walking Horse trainer from Wemding, Germany. She and her family own and operate Josef’s Walkaway Farm, which is a state of the art Facility with indoor arena, outdoor arena, multiple round pens, electric tread mills and walkers. She has the largest and most successful Tennessee Walking Horse training and breeding facility outside the US. Germany has few fences, so Denise also offers trail riding as it is always available there. During her career she is the only European to actually ship horses from Germany and win 3 World Championships and 3 Reserve World Championships at the TWH National Celebration. She has served on the Executive board of TWHBEA, and helped develop the TWH USLGE Program in Europe. Denise possesses a true gift for this breed of horse that has brought her to higher training levels than most ever reach. She has a true eye for the nature of a horse and the talent which lies inside. Denise starts many colts each year and is talented with development of both young horses and reshaping and progressing older ones. She had a full time riding program where she gives lessons, and hosts riding weekends and retreats. It is during camps and retreats that she began working with Nicole. Being fluent in English, Denise does all the translations for Nicole when she is in Germany teaching, and by working so closely over the last 10 years, Denise and Nicole have developed very similar teaching philosophies and techniques. Denise is very insightful with people and horses and possesses a true talent for bringing horses and riders together.